What's The Most Legendary Four-Banger Of All Time? Last winter, we asked for your opinions on the Most Legendary V8 Of All Freakin' Time and the Most Legendary Inline Six... and then I totally spaced on what may be the most important Legendary Engine question of all! Question Of The Day: Most Legendary V8 Of All Freakin&apos; Time? No problem— this way you've all had 9 months to ponder the question. Personally, I'm torn between the Offenhauser and the Ford Model T, but you don't have to go so far back in time to find plenty of four-cylinder engine legends. The Alfa Romeo Twin Cam? The Toyota R? The Volkswagen Air-Cooled? Some engine that isn't even in our Engine Of The Day Overload? What do you say? 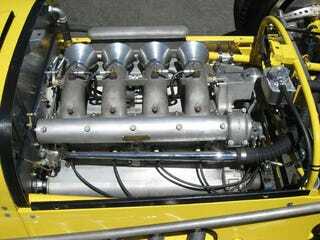 Workhorse Engine of the Day: Offenhauser!